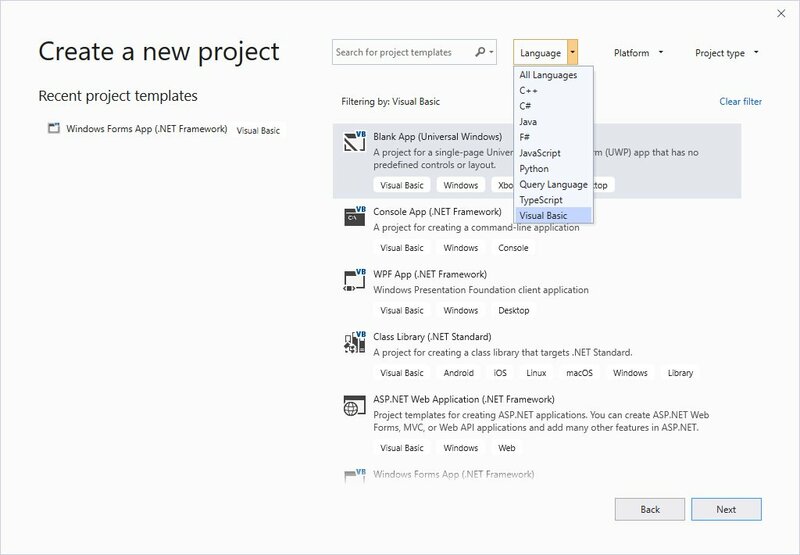 After downloading and installing VS 2019, you are now ready to launch Visual Studio 2019 and start programming in Visual Basic 2019. The VS2019 start page is quite different from VS 2017. 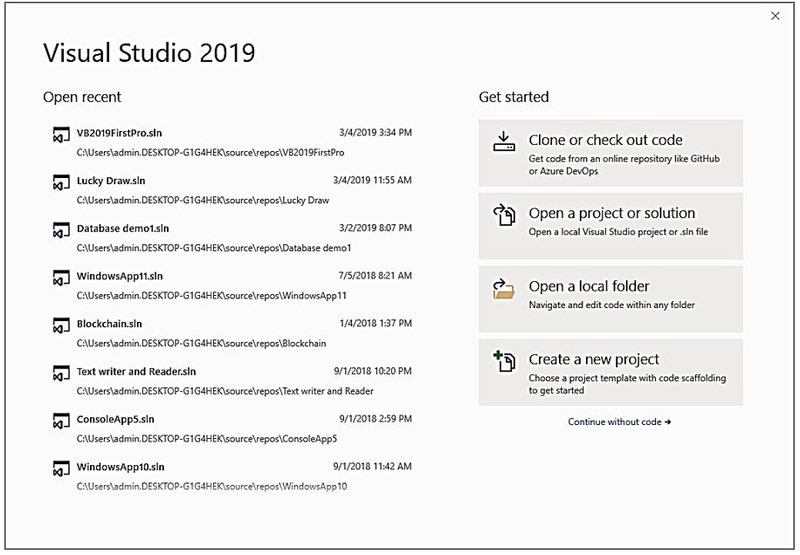 When you first launch Visual Studio 2019, the following start Page appears, as shown in Figure 1.1. 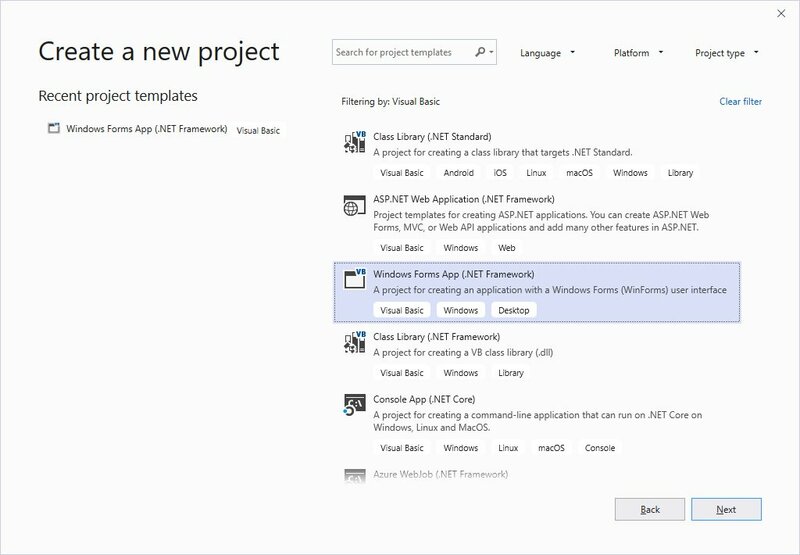 You can quickly launch recently open recently opened projects, clone from GitHub, open a project or solution, open a local folder or create a new project. 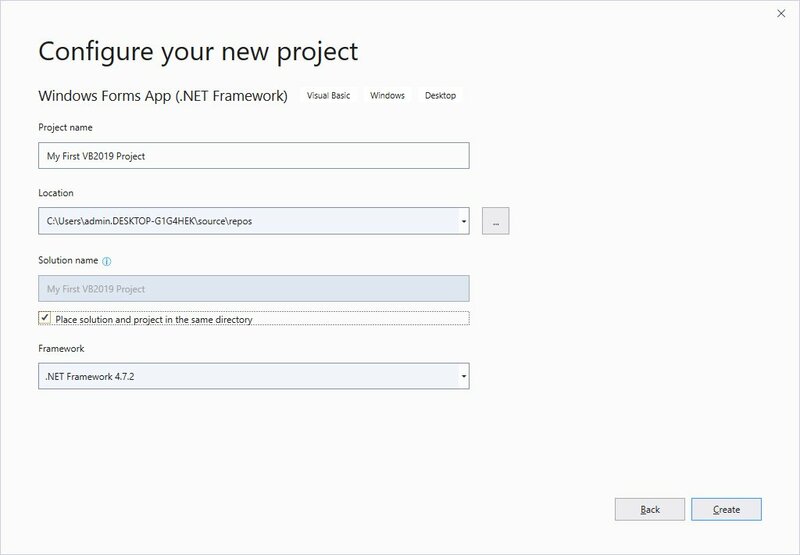 Upon clicking the selected project template, the project configuration page appears, as shown in Figure 1.4. You can configure your project by typing the project name and select a few other options. Upon clicking the Create button the Visual Basic 2019 IDE, as shown in Figure 1.6. You can see that the name of the project you entered earlier appears on the top right corner of the IDE. 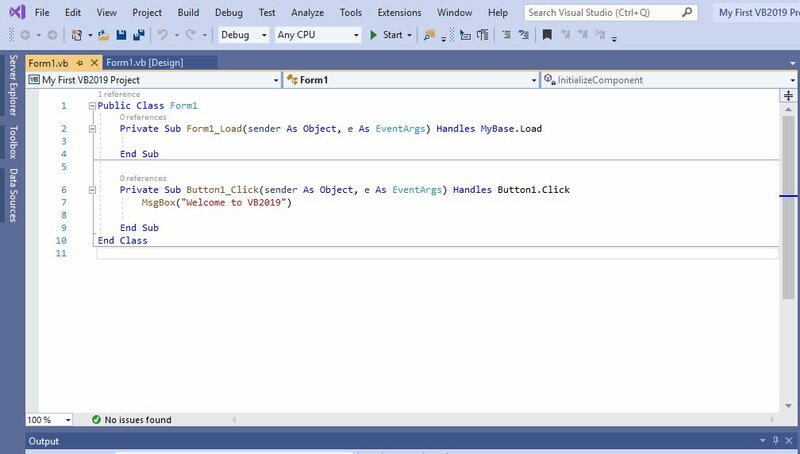 VB2019 IDE comprises a few windows, the Form window, the Solution Explorer window and the Properties window. 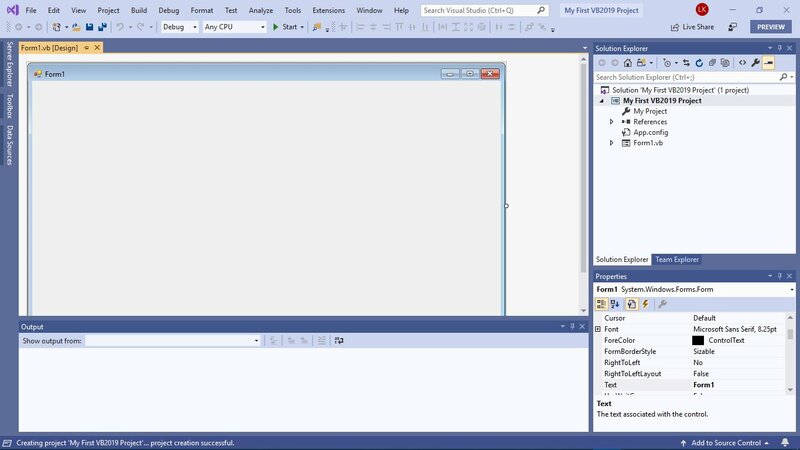 It also consists of a toolbox which contains many useful controls that allow a programmer to develop his or her Visual Basic 2019 program. The toolbox can be hidden or dragged to the bottom or side of the window. When you run this program and click on the Display Hidden Message button, you should get the following popup message box. The function MsgBox is a built-in function of Visual Basic 2019 and it will display the text enclosed within the brackets. 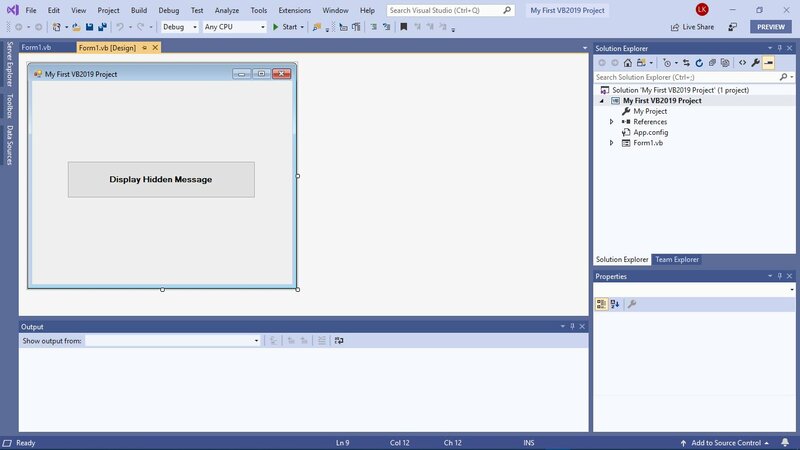 Now you have created your first program in Visual Basic 2019, we shall learn more Visual Basic 2019 programming techniques in coming lessons.